In Part Nine we looked at a GCM simulation over the last 120,000 years, quite an ambitious project, which had some mixed results. The biggest challenge is simply running a full GCM over such a long time frame. To do this, the model had a reduced spatial resolution, and “speeded” up all the forcings so that the model really ran over 1,200 years. The forcings included ice sheet size/location/height, as well as GHGs in the atmosphere. In reality these are feedbacks, but GCMs are not currently able to produce them. In this article we will look one of the latest GCMs but running over a “snapshot” period of about 700 years. This allows full spatial resolution, but has the downside of not covering anything like a full glacial cycle. The aim here is to run the model with the orbital conditions of 116 kyrs BP to see if perennial snow cover forms in the right locations. This is a similar project to what we covered with early GCMs in Part Seven – GCM I and work from around a decade ago in Part Eight – GCM II. The paper has some very interesting results on the feedbacks which we will take a look at. Models of intermediate complexity.. and flux- corrected GCMs have typically been able to simulate a connection between orbital forcing, temperature, and snow volume. So far, however, fully coupled, nonflux- corrected primitive equation general circulation models (GCMs) have failed to reproduce glacial inception, the cooling and increase in snow and ice cover that leads from the warm interglacials to the cold glacial periods. Milankovitch (1941) postulated that the driver for this cooling is the orbitally induced reduction in Northern Hemisphere summertime insolation and the subsequent increase of perennial snow cover. The increased perennial snow cover and its positive albedo feedback are, of course, only precursors to ice sheet growth. The GCMs failure to recreate glacial inception, which indicates a failure of either the GCMs or of Milankovitch’s hypothesis. Of course, if the hypothesis would be the culprit, one would have to wonder if climate is sufficiently understood to assemble a GCM in the first place. Either way, it appears that reproducing the observed glacial–interglacial changes in ice volume and temperature represents a good test bed for evaluating the fidelity of some key model feedbacks relevant to climate projections. The potential causes for GCMs failing to reproduce inception are plentiful, ranging from numerics on the GCMs side to neglected feedbacks of land, atmosphere, or ocean processes on the theory side. It is encouraging, though, that for some GCMs it takes only small modifications to produce an increase in perennial snow cover (e.g., Dong and Valdes 1995). Nevertheless, the goal for the GCM community has to be the recreation of increased perennial snow cover with a GCM that has been tuned to the present-day climate, and is subjected to changes in orbital forcing only. The numerical experiments are performed using the latest version of the National Center for Atmospheric Research (NCAR) CCSM4, which consists of the fully coupled atmosphere, ocean, land, and sea ice models..
CCSM4 is a state-of-the-art climate model that has improved in many aspects from its predecessor CCSM3. For the present context, the most important improvement is the increased atmospheric resolution, because it allows for a more accurate representation of altitude and therefore land snow cover. See Note 1 for some more model specifics from the paper. And a long time we looked at some basics of CCSM3 – Models, On – and Off – the Catwalk – Part Two. The CCSM does not yet contain an ice sheet module, so we use snow accumulation as the main metric to evaluate the inception scenario. The snow accumulation on land is computed as the sum of snowfall, frozen rain, snowmelt, and removal of excess snow. Excess snow is defined as snow exceeding 1 m of water equivalent, approximately 3–5 m of snow. This excess snow removal is a very crude parameterization of iceberg calving, and together with the meltwater the excess snow is delivered to the river network, and eventually added to the coastal surface waters of the adjacent ocean grid cells. Thus, the local ice sheet volume and the global fresh- water volume are conserved. Another bias relevant for the present discussion is the temperature bias of the northern high-latitude land. As discussed in the next section, much of the CCSM4 response to orbital forcing is due to reduced summer melt of snow. A cold bias in the control will make it more likely to keep the summer temperature below freezing, and will overestimate the model’s snow accumulation. In the annual mean, northern Siberia and northern Canada are too cold by about 1ºC–2ºC, and Baffin Island by about 5ºC (Gent et al. 2011). The Siberian biases are not so dramatic, but it is quite unfortunate that Baffin Island, the nucleus of the Laurentide ice sheet, has one of the worst temperature biases in CCSM4. A closer look at the temperature biases in North America, though, reveals that the cold bias is dominated by the fall and winter biases, whereas during spring and summer Baffin Island is too cold by approximately 3ºC, and the Canadian Archipelago even shows a weak warm bias. [Emphasis added, likewise with all bold text in quotes]. The subsequent sections will analyze and compare two different simulations: an 1850 control (CONT), in which the earth’s orbital parameters are set to the 1990 values and the atmospheric composition is fixed at its 1850 values; and a simulation identical to CONT, with the exception of the orbital parameters, which are set to the values of 115 kya (OP115). The atmospheric CO2 concentration in both experiments is 285 ppm. This experimental setup is not optimal, of course. Ideally one would like to integrate the model from the last interglacial, approximately 126 kya ago, for 10 000 years into the glacial with slowly changing orbital forcing. However, this is not affordable; a 100-yr integration of CCSM on the NCAR supercomputers takes approximately 1 month and a substantial fraction of the climate group’s computing allocation. First of all, they do produce perennial snow cover at high latitudes. The paper has a very good explanation of how the different climate factors go together in the high latitudes where we are looking to get perennial snow cover. It helps us see why doing stuff in your head, using basic energy balance models, and even running models of intermediate complexity (EMICs) cannot (with confidence) produce useful answers. This graph is comparing the annual solar radiation by latitude between 115 kyrs ago and today. Incoming solar radiation – black curve – notice the basic point that – at 115 kyrs ago the tropics have higher annual insolation while the high latitudes have lower annual insolation. Our focus will be on the Northern Hemisphere north of 60ºN, which covers the areas of large cooling and increased snow cover. 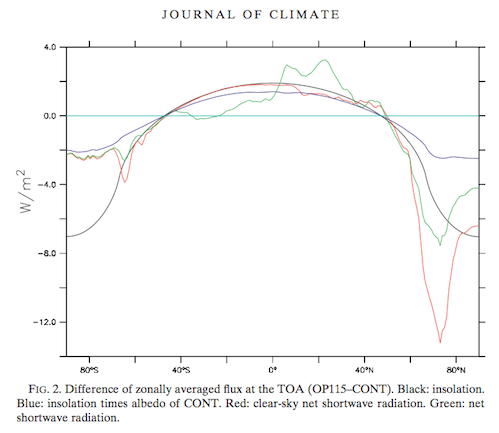 Compared to CONT [control], the annual average of the incoming radiation over this Arctic domain is smaller in OP115 by 4.3 W/m² (black line), but the large albedo reduces this difference at the TOA to only 1.9 W/m² (blue line, see also Table 1). Blue shows the result when we take into account existing albedo – that is, because a lot of solar radiation is already reflected away in high latitudes, any changes in incoming radiation are reduced by the albedo effect (before albedo itself changes). Green shows the result when we take into account changed albedo with the increased snow cover found in the 115 kyr simulation. In CCSM4 this larger albedo in OP115 leads to a TOA clear-sky shortwave radiation that is 8.6 W/m² smaller than in CONT —more than 4 times the original signal. The snow/ice–albedo feedback is then calculated as 6.7 W/m² (8.6–1.9 W/m²). Interestingly, the low cloud cover is smaller in OP115 than in CONT, reducing the difference in total TOA shortwave radiation by 3.1 to 5.5 W/m² (green line). Summing up, an initial forcing of 1.9 W/m² north of 60ºN, is amplified through the snow–ice–albedo feedback by 6.7 W/m², and damped through a negative cloud feedback by 3.1 W/m². Because of the larger meridional temperature (Fig. 1a) and moisture gradient (Fig. 4a), the lateral atmospheric heat flux into the Arctic is increased from 2.88 to 3.00 PW. This 0.12 PW difference translates into an Arctic average of 3.1 W/m²; this is a negative feedback as large as the cloud feedback, and 6 times as large as the increase in the ocean meridional heat transport at 60ºN (next section). Thus, the negative feedback of the clouds and the meridional heat transport almost compensate for the positive albedo feedback, leading to a total feedback of only 0.5 W/m². One way to look at these feedbacks is that the climate system is quite stable, with clouds and meridional transports limiting the impact of albedo changes. This may explain why some numerical models have difficulties creating the observed cooling associated with the orbital forcing. Thus, in contrast to the results of Vettoretti and Peltier (2003) the increase in snowfall is negligible compared to the reduction in snowmelt. The global net difference in melting and snowfall between OP115 and CONT leads to an implied snow accumulation that is equivalent to a sea level drop of 20 m in 10,000 years, some of it being due to the Baffin Island cold bias. This is less than the 50-m estimate based on sea level reconstructions between present day and 115 kya, but nonetheless it suggests that the model response is of the right magnitude. This current has a big impact on the higher latitudes of the Atlantic because it brings warmer water from the tropics. The meridional heat transport of the AMOC is a major source of heat for the northern North Atlantic Ocean, but it is also believed to be susceptible to small perturbations. This raises the possibility that the AMOC amplifies the orbital forcing, or even that this amplification is necessary for the Northern Hemisphere glaciations and terminations. In fact, JPML demonstrates that at least in one GCM changes in orbital forcing can lead to a weakening of the MOC and a subsequent large Northern Hemisphere cooling. Here, we revisit the connection between orbital forcing and AMOC strength with the CCSM4, which features improved physics and higher spatial resolution compared to JPML. In essence they found a limited change in the AMOC in this study. Interested readers can review the free paper. This is an important result because earlier studies with lower resolution models or GCMs that are not fully coupled have often found a strong role for the MOC in amplifying changes. This is an interesting paper, important because it uses a full resolution state-of-the-art GCM to simulate perennial snow cover at 115 kys BP, simply with pre-industrial GHG concentrations and insolation from 115 kyrs BP. Can a high resolution AOGCM with no high latitude cold bias reproduce perennial snow cover with just pre-industrial GHG concentration and orbital forcing from 115 kyrs ago? Can this model, with its high latitude cold bias, reproduce a glacial termination? That doesn’t mean the paper isn’t very valuable and the authors have certainly not tried to gloss over the shortcomings of the model – in fact, they have highlighted them. What the paper also reveals – in conjunction with what we have seen from earlier articles – is that as we move through generations and complexities of models we can get success, then a better model produces failure, then a better model again produces success. Also we noted that whereas the 2003 model (also cold-biased) of Vettoretti & Peltier found perennial snow cover through increased moisture transport into the critical region (which they describe as an “atmospheric–cryospheric feedback mechanism”), this more recent study with a better model found no increase in moisture transport. The details of how different models achieve the same result is important. I don’t think any climate scientist would disagree, but it means that multiple papers with “success” may not equate to “success for all” and may not equate to “general success”. The details need to be investigated. This 2012 paper also demonstrates the importance of all of the (currently known) feedbacks – increased albedo from increased snow cover is almost wiped out by negative feedbacks. More importantly, though, the lack of any significant Southern Hemisphere polar response needs explaining (Fig. 1). While Petit et al. (1999) suggests that Antarctica cooled by about 10ºC during the last inception, the more recent high-resolution analysis by Jouzel et al. (2007) suggest that it was only slightly cooler than today (less than 3ºC at the European Project for Ice Coring in Antarctica (EPICA) Dome C site on the Antarctic Plateau). Of course, there are substantial uncertainties in reconstructing Antarctic temperatures.. I don’t have any comment on this particular point, lacking much understanding of recent work in dating and correlating EPICA (Antarctic ice core) with Greenland ice cores. The ocean component has a horizontal resolution that is constant at 1.125º in longitude and varies from 0.27º at the equator to approximately 0.7º in the high latitudes. In the vertical there are 60 depth levels; the uppermost layer has a thickness of 10 m and the deepest layer has a thickness of 250 m. The atmospheric component uses a horizontal resolution of 0.9º x 1.25º with 26 levels in the vertical. The sea ice model shares the same horizontal grid as the ocean model and the land model is on the same horizontal grid as the atmospheric model. Of course, if the hypothesis would be the culprit, one would have to wonder if climate is sufficiently understood to assemble a GCM in the first place. Thus, the negative feedback of the clouds and the meridional heat transport almost compensate for the positive albedo feedback, leading to a total feedback of only 0.5 W/m². I would take that statement with a few tons of salt also. When contemporary models are given information about Earth’s present condition – the size, shape and topography of the continents; the composition of the atmosphere; the amount of sunlight striking the globe – they create artificial climates that mathematically resemble the real one: their temperatures and winds are accurate to within about 5%, but their clouds and rainfall are only accurate to within about 25-35%. I have even less faith in their ability to calculate changes in the AMOC, given the reliance of AOGCM’s on aerosol kludges to reproduce the mid-twentieth century cooling. Unfortunately, such a margin of error is much too large for making a reliable forecast about climate changes, such as the global warming will result from increasing abundances of greenhouse gases in the atmosphere. Yet that doesn’t stop them from making public statements as if the models were making reliable forecasts. The negative feedback of the clouds is mostly due to a reduction of low cloud cover over the ocean and coastal areas during summer, which leads to reduced reﬂectivity or shortwave cloud forcing (Fig. 3). These high-latitude stratus clouds have a similar effect as snow or ice: they reﬂect sunlight. Unlike at lower latitudes, Arctic low cloud formation via coupling with the ocean is frequently inhibited by sea ice and surface temperature inversions. While the presence of open water in the Arctic does not guarantee atmosphere–ocean coupling and low cloud formation, open water has been shown to increase Arctic cloud cover when atmosphere–ocean coupling is strong (Kay and Gettelman 2009). Since the Arctic Ocean in OP115 is colder and has more sea ice cover than in CONT, especially in summer, reductions in low cloud amount are not surprising, and serve to counteract the positive ice–albedo feedback from increased sea ice cover..
..but the physics of low Arctic clouds is one of the weak points of current GCMs (e.g., Kay et al. 2011). This does not mean that the CCSM4 response of Arctic clouds to insolation is necessarily wrong. The paucity of observations relevant for sea ice–cloud feedbacks means, however, that there have been only a few opportunities to test this aspect of the model. (And they also comment on the biases of the model for the MOC and its uncertainties). Regardless of what people think about the accuracy of this model, or any GCM, on clouds, what is more interesting (at least to me) is the way in which the ‘positive feedback from albedo’ gets diminished to very little by the consequent negative feedbacks. And of course, with the uncertainties around clouds, the overall value after taking into account all feedbacks could be a net zero. Alternatively, it could be that clouds don’t diminish the positive albedo at all. The overall point being that simple energy balance models and EMICs (Earth Models of Intermediate Complexity) have a much more simplified approach and it is hard to think that they are able to represent these feedbacks in a more accurate way, except of course by chance. Those simplified models can help us gain some insight into how various parameters and feedbacks affect the outcomes (they are able to run large numbers of simulations), but they cannot claim to be better than GCMs. So whatever the weaknesses of GCMs their results are of more interest than any the results from any other model. But we have to be aware of their biases and of where the chief uncertainties lie. Not specific to this article but I’m looking for various source data to overlay temperature on the orbital, CO2 & CH4 curves. Various papers have various graphs but usually too low resolution to be able to look at areas of specific interest in any detail. One of the 2010 EPICA papers pointed to Paleoclimatology Data archived by the NCDC. Looks like it could be a good data source. As a start I’m looking specifically for the proxy temperatures from the Greenland and Antarctica ice cores, along with CO2/CH4. Many of the older temperature reconstructions were dated according to the orbital curves on the basis that the Milankovitch hypothesis was true – this is not the case for the ice cores. I would take the conversion of isotope ratio to temperature in ice cores with considerable salt. You might just want to use the isotope ratio directly. As I remember, the isotope ratio is most strongly influenced by the surface temperature of the water where it evaporated. That’s a long way from, say, Vostok. Considering the rate of accumulation of ice varies a lot between glacial and interglacial epochs, dating is still not entirely straightforward. There was mention of orbital cycles at the cdiac site. The difference between the trapped gas age and the age of the ice surrounding it can be thousands of years. So, global cloud feedback is Positive when temperatures go up as well as when temps go down. I can’t comment generally on climate models and their global cloud feedbacks. But this specific model run under conditions of 115kyrs BP found that for the high latitude region, the impact of clouds was to reduce the positive feedback from snow/ice associated with the reduced temperatures. I.e., under these conditions, and for this region, clouds were a negative feedback. The other feedback is less surprising – if you reduce the temperature of the arctic and increase the temperature of the tropics, more heat is transported (by ocean and atmosphere) from equator to pole. This is just the natural result of any temperature difference, heat transfer always acts to reduce it. This is just the natural result of any temperature difference, heat transfer always acts to reduce it. Except when it doesn’t. If this were the case, there would be little polar amplification with the poles warming more than the tropics during warming and cooling faster during cooling. The idea that the feedbacks nearly cancel out would seem to require an incredibly high climate sensitivity. But if that were the case, temperature would now be climbing faster than it is. Either that or the climate is highly non-linear with forcing and the equilibrium sensitivity is much larger than the transient sensitivity. That too is hard to believe.